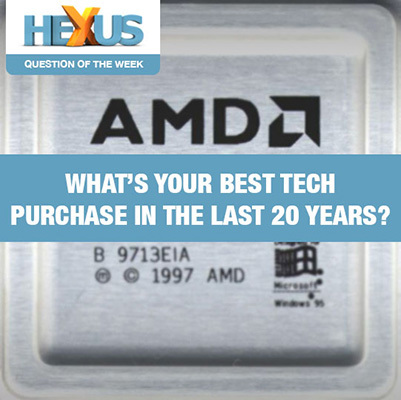 QOTW: What's your best tech purchase in the last 20 years? June 2018 marks the 20th anniversary for HEXUS. Time flies, doesn't it? A heck of a lot has changed in those 20 years from a technology point of view. Gone are the days of paid-per-minute dial-up Internet, CRTs, and boring beige towers. In comes 4K, RGB, powerful mobile phones and super-fast broadband. And that's just scratching the surface. Heck, many of our readers will have been born after HEXUS was founded! What's your best tech purchase in the last 20 years? It's a toughie because so many products were good for their time, or some that you really looked forward to for one reason or another. But choose one. Getting the ball rolling, for me it was the original iPhone back in September 2007 - it changed mobile phones forever, and it was heck of a talking point. A GPS tracker for the Moose. Toyota Prius: Now at 153,000 miles, only major repair was some worn out wheel bearings 3 years ago, just passed MoT again with no advisories, still doing 55mpg on average. Crikey, I was a mod here before the wipe in 2003 named Grendel, probably be around 17 year or so thinking on it now!!! As for tech purchases my Athlon 64 from around 2003 is still in use on a little unknown motherboard brand who are even bigger now…ASRock!!! This machine is now used alongside another with a 2007 Socket 939 setup for writing floppy discs with them having internal drives, writing stuff for Atari ST and also hooking my parallel cable up to my Commodore 1540 disc drive to write C64 discs.